It’s been quite a while since I researched Native American stuff, but recently I happened to get back into some of that and discovered that the Cherokee Nation of Oklahoma has elected a new principal chief since last I checked, Bill John Baker (he was elected in 2011, so that shows how long I’ve been out of the loop!). When I looked him up, my first thought was “He doesn’t look very Cherokee!” And come to find out, as far as his ethnic background goes, he is actually 1/32nd Cherokee. This led me to a little more research on blood quantum requirements in Indian tribes—basically the requirement that a person have a certain percentage of ancestry from that tribe in order to have tribal citizenship. It’s certainly an interesting concept, especially since it really wouldn’t fly in other nations—just think, what if a European country introduced some blood quantum law that says you must be a certain percentage white in order to be a citizen? Cries of “Racism!” would be everywhere. But Indian tribes are a different ballgame, or so it seems. It happens to be the case, however, that the Cherokee Nation of Oklahoma does not have blood quantum requirements—all that is required is that you be able to trace your family tree back to someone on the Dawes Roll, a roster of Cherokees made by the US government in the 19th century. Thus, it doesn’t matter what percentage Cherokee you are; if one of your ancestors was a registered Cherokee, then you can join the tribe. Other tribes have chosen to require a blood quantum to have citizenship—for example, the United Keetoowah Band of Cherokees (also in Oklahoma) requires 1/4 Cherokee blood in order to be a citizen of their nation. I live under a rock. And it wasn’t until yesterday that I was informed of the big news that happened while I was chilling out under said rock. Frankly, I was not surprised to hear it, nor was I horrified or thunderstruck. Really I’m surprised it hasn’t happened sooner, what with the way things are going these days. And it’s no secret where Google’s allegiance lies–I happened to open YouTube this morning to see a whole featured playlist of videos under the title “#LoveWins in Supreme Court Ruling.” The phrase “Love Wins” really struck me, and got me to thinking. As we traveled through Great Britain, it was soon evident that the upcoming papal visit was a hot topic. Our tour guides commented on it, and from Scotland to England we heard about how the head of the Roman Catholic Church was coming to the United Kingdom by royal invitation for the first time. 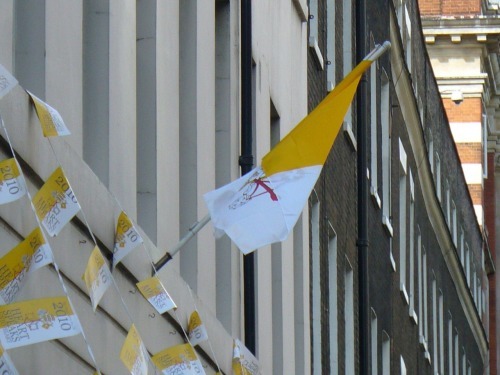 The building next to our hotel in London proudly displayed the flag of the Vatican City and was bedecked with yellow and white streamers, and each edition of the London Evening Standard during the time we were there had a story on the pope on the front page. Of course the event fomented much controversy. Many objected to the pope’s coming, but the fact remains that he came, and that alone is significant. Every time I heard or saw an allusion to it, I thought about how Catholics have often been persecuted in Great Britain since the time of Henry VIII, and how ridiculous it would have been in past years for the head of the Catholic Church to set foot in the land where the Church of England held sway. Such a thing would never have happened, and demonstrates how ecumenical people of all denominations—even traditionally conservative Catholics—have become. After all, if it doesn’t matter what church you belong to, even once-hostile Anglicans and Catholics can unite. I just voted in the Texas Republican primary, and as my second chance to vote, I was quite excited about having my say in the world of politics. However, I was not a little disconcerted when I noticed that all the other early voters who were there were voting on the Democrat side–evidently for their chance to decide between Hillary Clinton and Barack Obama. What’s so odd about that? you may ask. Well, it may help to put this in perspective. I live in Parker County, a place where local officials are elected at the primary since there are hardly ever any Democrat contenders. Thus I was very surprised to see so many people voting Democrat. Does this forebode something? I’m afraid so. Let’s just hope that if the people of the United States really are willing to have another Democrat in the White House for four years, that they’ll be more sensible by the time the next election rolls around.